Back in the late 1950s and early 1960s I was part of a revival of folk music that stretched across the country. I have told everyone about my time hitchhiking with Bob Dylan, putting on a concert for him at the Michigan Union in Ann Arbor, and so. I have not said as much about my travelling with Perry Lederman, one of the best Travis-style (3-finger picking) instrumentalists I have ever heard. Lederman and I both were friends of Dylan, and I travelled a lot with Lederman, just the two of us. I can remember meeting Lederman's mom in Brooklyn, New York, where she served us home-made matzo-ball soup. While Perry and his mom talked, I sat at a little kitchen table and stared out the window at a gray cityscape. The next day, we joined up with Dylan and the three of us hitched on to Boston and Club 47. After that, Dylan hitched on alone to Syracuse or somewhere around there, while Lederman and I hitched to Laconia, New Hampshire to take in the motorcycle races there. That is a story in itself, where I ended up going 90 MPH on the back of a Norton. I digress. As folkies, all of us were into original sources and one of those sources which everyone who was anyone knew was the incredible music of the Swan Silvertones. I was never the big doper, but I do remember toking up a time or two and listening to the Swan Silvertones and just marveling at the music. The Swan Silvertones, along with gospel groups like the "Mighty Clouds of Joy" and the "Dixie Hummingbirds," were the premiere gospel groups and one of the great music experiences awaiting anyone who has never heard them. If you are not a fan of gospel music or “religious” music of any kind, don’t let that fact deter you from having this unique listening experience -- pure music at the highest level. The a-cappella quartet "Four Harmony Kings" was created by tenor Claude Jeter in 1938 in Coalwood, West Virginia, but the name was changed to the Swan Silvertones when they began a 15-minute radio show sponsored by the Swan Bakery Company on the Knoxville station WBIR in 1942. They developed a national reputation during their contract with King Records from 1946 to 1951, recording some 21 recordings (mostly in the jubilee gospel style) including “I Cried Holy” and “Go Ahead”. They joined Specialty Records from 1951 to 1953, but issued only four singles (in a more contemporary, harder style) before they were dropped by that label. The early group had lead singers Claude Jeter and Solomon Womack, tenors Robert Crenshaw and John Manson, baritone John H. Myles, and bass Henry K. Bossard. They really came into their own when they signed and recorded with Vee-Jay Records and recorded with that label from 1956 through 1964. The smoother Vee-Jay sound is probably due to arranger Paul Owens, who joined the group in 1952. Influenced by jazz-vocal groups like the Four Freshmen and the Hi-Los, Owens smoothed out the sound and made it more contemporary, even progressive. Starting in 1956, the group began adding instruments to what had been up until then a purely vocal or a-capella sound. The excellent guitarist Linwood Hargrove added greatly to the emerging Vee-Jay sound and the additions (on recordings) of jazz sidemen Bob Cranshaw on bass and Walter Perkins -- founding members of MJT+3 (Modern Jazz Two) -- on drums completed the sound. Perhaps their greatest hit was “Oh Mary Don’t You Weep,” released in 1959 -- an incredible listening experience. It is in this song that Claude Jeter intones the phrase “I’ll be a bridge over deep water, if you trust in my name” that inspired Paul Simon to compose “Bridge Over Troubled Water” some years later. The Swan Silvertones had a great effect on many rock (Al Kooper) and country (Gary Stewart) artists. In other words, we all knew the Swan Silvertones, and you should too, or at least hear to see if you like them. During their nine years at Vee Jay, the main members of the group were tenor (and falsetto) Claude Jeter, baritone John H. Myles, tenor, Paul Owens, and Bass William Conner. Other singers who were in the group during that time were tenors Dewey Young, Robert Crutcher, and Louis Johnson. 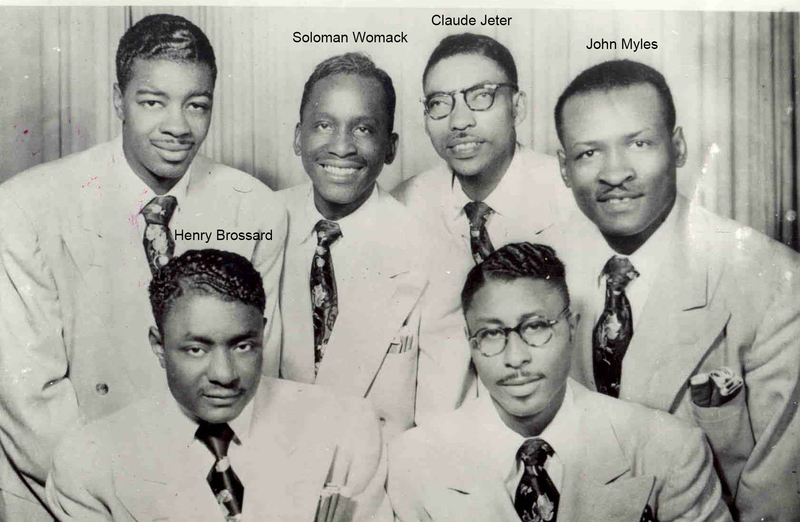 When Vee Jay closed in 1965, the group moved to Hob records, where they did one last album before Claude Jeter left to record on his own and focus on his ministry. The Swan Silvertones have had an enormous effect on many musicians. It is hard to listen to their best work with its harmonic complexity and spiritual simplicity or punch and not be moved by the sheer power of the music. I am not talking religious message here; the music itself is awesome. I envy those of you who have never heard the group your first listen, which you can do right now. If you like Sam Cooke, then you owe it to yourself to hear where it all came from, the brilliant tenor and falsetto voice of Claude Jeter. “Seek, Seek,” a song which my band did for many years. Any Swan Silvertones you can find on VeeJay represents their best, followed by what had been released on Specialty. The VeeJay twofer “Swan Silvertones” is the one to get. It contains the two original albums “Swan Silvertones” (perhaps their best) and “Singin’ in My Soul”. This is quintessential Swan Silvertones at their peak. Songs like “Love Lifted Me,” and “I’ll Be satisfied’ -- 12 songs from a single session in 1964 have captured some of the finest work of this legendary group. This makes for deep satisfying listening. This is early Swan Silvertones on VeeJay, recorded in sessions in 1956, 1957, and 1961 but not compiled and released as an album until 1974. It is available on the VeeJay two-fer “The Swan Silvertones” along with another great album “Let’s Go to Church Together." Here is one CD with two classic VeeJay albums (24 tracks) of vintage Swan Silvertones. These tracks (both albums) came from six sessions for Vee-Jay when the group was at its creative peak. The album “Swan Silvertones” is perhaps the single best album they ever put out, containing 12 tunes including their hit “Oh Mary Don’t You Weep,” “How I Got Over,” “My Rock,” “The Lord’s Prayer,” “When Jesus Comes,” and “Great Day in December” -- all incredible music experiences. The music continues with the album “Singin’ in My Soul”, 12 more prime Vee-Jay cuts including “End of My Journey,” “Jesus is Alright with Me,” and their version of “Rock My Soul”. (5 stars, Pick) Swan Silvertones/"Swan Silvertones"
Here is perhaps the best of the VeeJay albums (12 tracks) of vintage Swan Silvertones. These tracks came from six sessions for Vee-Jay when the group was at its creative peak -- perhaps the single best album they ever put out. It contains their hit “Oh Mary Don’t You Weep,” “How I Got Over,” “My Rock,” “The Lord’s Prayer,” “When Jesus Comes,” and “Great Day in December” -- all incredible music experiences. Here is one of the classic VeeJay albums (12 tracks) of vintage Swan Silvertones. These tracks came from six sessions for Vee-Jay when the group was at its creative peak. The album includes “End of My Journey,” “Jesus is Alright with Me,” and their version of “Rock My Soul”. So there you have an introduction to a little pocket of pure music that cannot but help enrich your life, at least it did mine.